What is the Lisfranc Ligament? It is a ligament that goes from the middle cuneiforms to the base of the second metatarsal. This ligament is responsible for midfoot stability. It occurs in a region of the foot known a the LisFranc joint complex, consisting of the ligament, bones, and soft tissues of the midfoot. 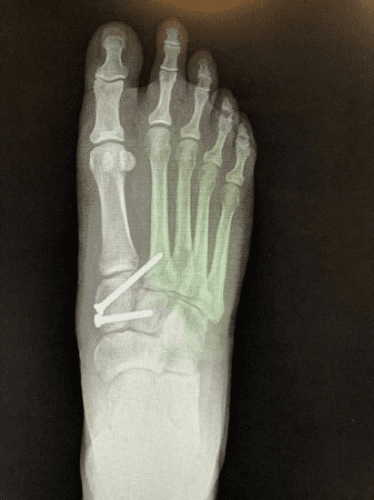 What can Cause a Lisfranc Injury? A simple twist or fall can cause a midfoot lisfranc ligament injury. This injury can occur in both high and low energy situations, and can occur to athletes such as football players.. Diagnosis is missed 20 percent of the time. How do I Know if I have a Lisfranc Injury or Fracture? If you felt a pop or snap at the time of injury on top of your foot, and have significant pain to middle of your foot with increased swelling, bruising and you are unable to bear weight. Often, without a proper medical diagnosis, people will believe they have a simple sprain. It can cause chronic pain, and will not heal well on it’s own. You will initially need x-rays to diagnose a Lisfranc fracture. MRI or CT scan may be indicated for surgical planning. 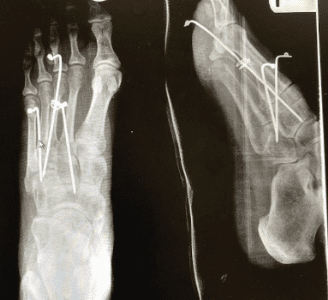 What is the Initial Treatment for a Lisfranc Fracture? Initially, resting, elevating, icing and compressing the area with ACE bandage will help. Anti-inflammatory medications might be useful to control pain levels. Crutches and a walking boot will be useful to stay off the affected foot. Not all fractures will require surgery, depending on the severity of the midfoot dislocation, it will be determined if you require surgery. The team at Foot, Ankle & Leg Vein center will evaluate your foot and come up with a treatment plan that is right for you, depending on the fracture pattern. Conservative treatment consists of non-weight bearing in a cast or boot, resting, icing and elevating with compression. What will Surgical Treatment Consist of? Typically depending on the severity of the fracture, surgery usually requires screws, wires and plates for fixation. This would commonly be called “screw fixation”. Typically bone heals in about 6 weeks and will require no weight on the fractured foot for 6 weeks. Do you believe you have a LisFranc injury? At our Foot, Ankle & Leg Vein Centers, we treat many kinds of foot injuries. Schedule a consultation today, and we would be happy to assist you with your injured foot.